Sometimes all you really need is a bit of quick shooting action. 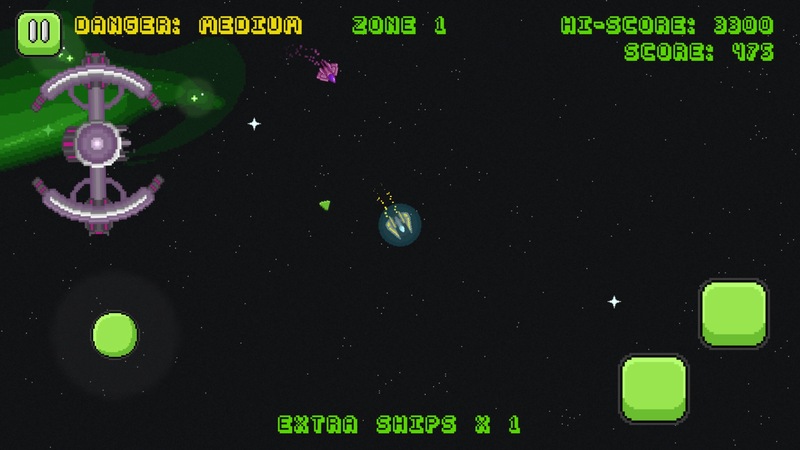 Beyond Helios ($0.99) aims to fill that need in a game that feels like an homage to classic arcade shooters like Sinistar. Minus Sinistar itself, of course. No one can imitate that guy. 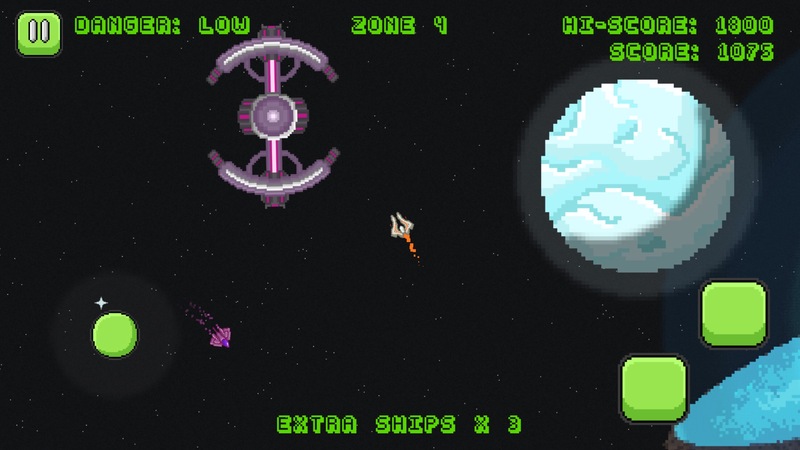 You’ll hop in your ship of choice and fly around freely in overhead stages set in space. There are a number of targets you’ll need to take out, enemy ships that will hassle you as you attempt to do so, power-ups that will give you a temporary boost, and some hazards that will kill you if you bump into them. It’s a pretty fast-paced game and there are some rough edges here and there, but overall there’s a fair bit of fun to be had here for action fans. Beyond Helios is a score-attack shooter. It’s apparently endless, throwing one procedurally-generated stage after another at you. Given that, stages will often contain a different number of targets from playthrough to playthrough. Sometimes you’ll have an easier time progressing through stages as a result, though the downside is that you’ll probably end up with a lower score. Besides aiming for a high score, the other thing you’ll be looking to do is to collect gems. The game has a bunch of ships you can use, but all but one is locked at the start of the game. Each ship has its own unique properties, and some of them are definitely more useful than others. You can buy new ships in the game’s shop by forking over a hefty chunk of gems. 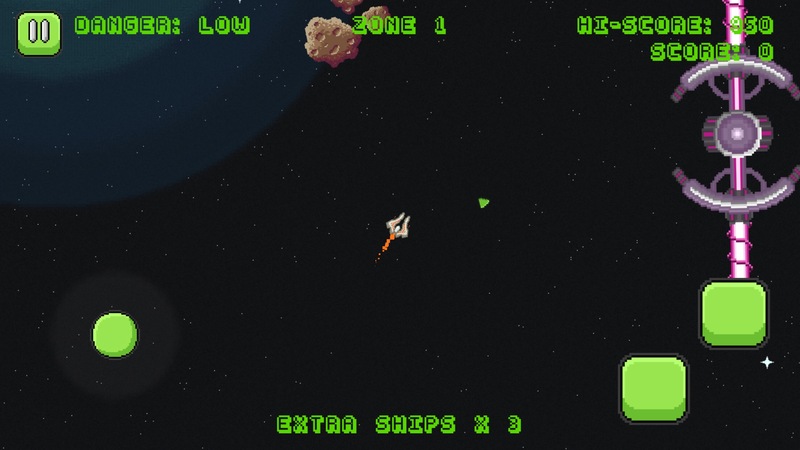 Regardless of the ship you’re using, the basic controls and gameplay mechanics are the same. You have a virtual stick you can use to fly in any direction, a button for your main guns, and another button for your sub-weapon. The starting ship has a bomb that drops out directly behind you for its sub-weapon, as an example. 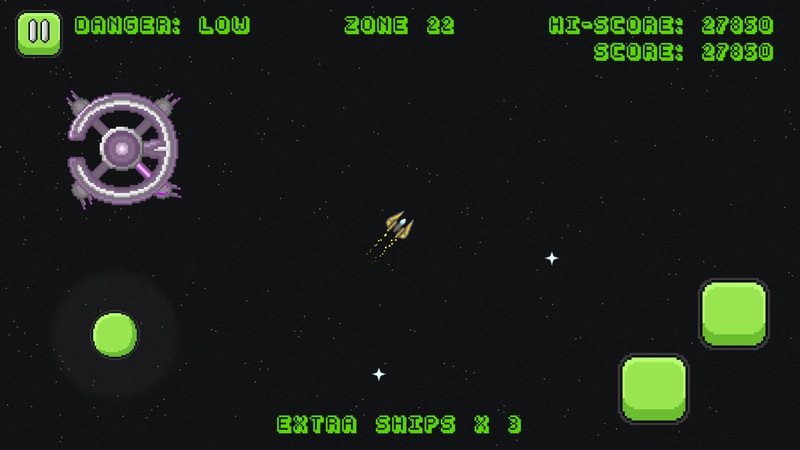 The controls work reasonably well, and your ship has a nice zippy feel to it that makes it fun to zoom around in. Not that you’ll have a lot of time for joy-riding, mind you. If you venture too far from the action, a timer will count down and a message will flash to nudge you back on track. Your goal on each stage is to seek out and destroy however many battle stations are on the map. A green arrow will point towards the nearest one so you don’t really have to worry too much about exploration. Stations come in a couple of different types. One has four turrets that you’ll need to destroy in order to take it out. Another spins around with a deadly pair of lasers, leaving two weak points you can shoot to destroy it. Both types will also generate enemy ships that will aggressively harass you as you try to go about your business. As one final punch, each station you destroy will explode, causing fatal damage to anything in its immediate vicinity. Aside from the stations and their sentries, you’ll also need to keep an eye out for solid obstacles like asteroids, which will kill you on contact, and enemy warships, which bring a lot of firepower to bear on you while also sending out sentries of their own. Usually, it’s best just to stay away from these guys if you can. The funny thing is that these warships seem to be on a different side from the battle stations, and pretty much all of the enemy attacks appear to be capable of destroying other enemies just as well as they can take you out. So if an enemy warship ventures too close to the spinning lasers of a battle station, it will be sliced and diced just the same way you would be. It can make for some amusing scenarios, and if you’re clever you can even work it into your strategy. You’ll begin each stage with three ships to spare. These will be replenished if you can make it to the next stage, but should you run out completely, that’s the end of your run. Everything is a one-hit kill in Beyond Helios, unless you manage to pick up a shield power-up. That one allows you to take one shot from a laser, but won’t protect you from any impact damage. Other power-ups include extra ships, a small stock of heat-seeking missiles, a bomb, and so on. They appear randomly, and depending on exactly where they appear, they can either be useless or critical to your survival. Extra ships are always nice, and the missiles can be useful for taking out the laser-arm battle stations, but in general your ship’s own weapons are going to be your best friends. There are two ways to get your hands on the gems you need to unlock more ships. You can earn them by clearing stages. Stages one through nine earn you one gem each, ten through nineteen get you two gems, twenty through twenty-nine get you three gems, and so on. You’ll earn gems every time you clear a stage, so this is theoretically a endless source of them, albeit a slow one while you’re still developing your skills. The other way to get gems? Well, you can buy them via IAP, of course. One dollar will get you 150 gems, enough to buy one new ship, and it’s a route I’d recommend if you find yourself struggling trying to get anywhere with the starting ship. It might seem like the game is trying to push you towards the IAPs, but I actually found myself reliably earning twenty to thirty gems per play before too long. Oh, you can also spend gems on some quirky cosmetic explosions. I won’t stop you if that’s what you want to do. I was a little resentful of the whole gem situation while I was coming to grips with the game, but ultimately it ended up trickling out new stuff to me at a fair rate. The ship you start with definitely has some issues as far as crowd control goes, though. You’ll want to ditch it fast. Beyond Helios can be pretty challenging, all things considered. Some of it is fair, but there are other elements that aren’t quite so equitable. Your arrow doesn’t indicate how far a station is, for one thing, which can lead to you zooming right into a laser-arm station just as it starts to swing. Enemies will sometimes shoot at you from off-screen, but that only seems to happen if you engage them first and try to get away, so I don’t know how much I want to pick on that. The backgrounds are very colorful and look nice in their own way, but they’re so busy that you sometimes can’t see the things that you need to against them. It’s also not clear which objects will harm your ship and which are simply decorations, though I suspect most players will sort that out quickly enough. The game has a nice retro vibe to its visuals and music, and it certainly feels fast. In terms of bells and whistles, you can swap the virtual controls, adjust the zoom level of the playing field, and even adjust the size of the UI. The game supports Game Center leaderboards, and given how well it works as a score attack game, I’m happy it does. Of course, the procedurally-generated nature of the levels combined with the way ships are earned means the playing field isn’t necessarily level, but I still found it fun to shoot for a higher score anyway. Beyond Helios isn’t a terribly complicated game. Like the arcade games it pays homage to, it’s best for a quick game here and there rather than locking in for a longer session. It controls well, presents exciting action, has lots of stuff to unlock, and generally manages to be more fun than frustrating. 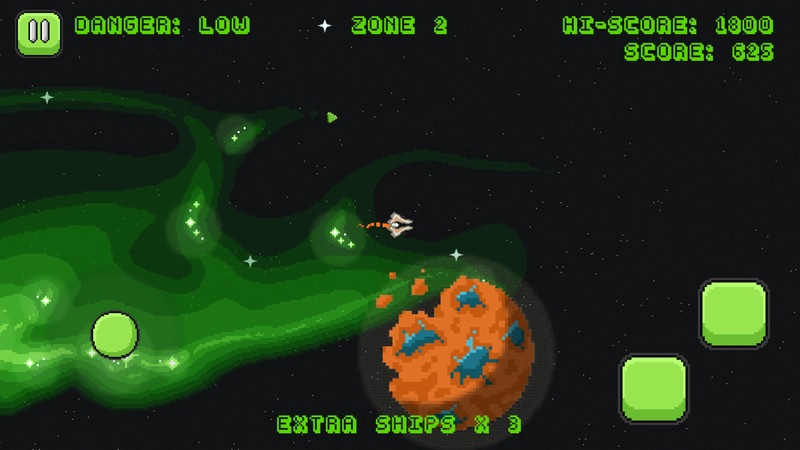 It’s not going to knock your socks off with innovative features or anything like that, but if you still have it in you to enjoy the simple pleasure of pointing a little pixel ship at pixel aliens and blasting them into oblivion, you’ll want to give this one a look.